I ACTUALLY Read the Wizard of Oz today! A Gray Saturday at Angus Manor, so I’ve decided to catch up on some reading. I’ve watched the Wizard of Oz on TV many times, but today, I decided to actually read the Wizard of Oz. WOW! They really took some liberties with the movie! THE BOOK IS REALLY DIFFERENT! DID YOU KNOW? 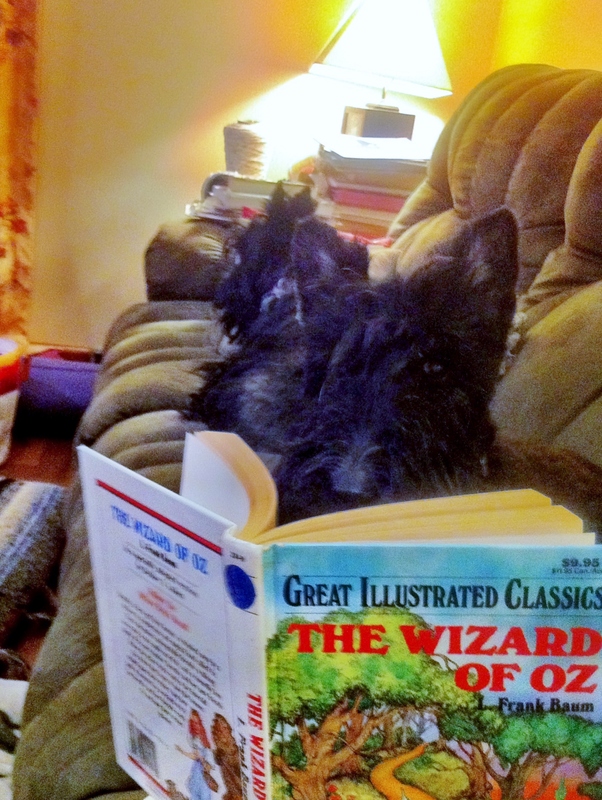 That Dorothy was actually a Scottie names ANGUS and lived in Illinois? Angus took the Ruby Red USB 16 GB Thumbdrive from the neck of the Wicked Witch of the East, and the Wicked Witch of the West, who watched everything via spyware installed on the thumbdrive, swore vengeance! On the way to Oz to see the Wizard, Angus was joined by another Scottie named Ainsley, who wanted a brain, by Catman, who needed courage, and by Lord Zuckerberg, WHO NEEDED A HEART! They finally made it to Oz but was disappointed – because it turns out the Wizard was a fraud, and was actually only a technical support agent from India, whose only suggestion was to unplug and plug back in the device. Previous Post Angus’ Poll Question of the Week! Next Post To Paraphrase the Late Great Robert Kennedy…. I never read that version! Love the ending though. Thanks, Angus. Wow! I like that version better…..so exciting. Sy Angus….you need to go into book writing………good version, especially the part of the Scottie Dog name Angus…….we just knew they had intermuts way back then. I like your version best. Does Lord Z turn into the pig farmer at least? RE: book idea… 10 pages is a chapter- around 3,000 words… 10-15 Scotties each writing a chapter with photos…. Probably sell so well we could buy 51 percent of Facebook Inc stock then Zuckernerd would be our puppet…. Unless FB is currently being operated by the NSA???? BOL, I need to read dat vershun! Who knew, thanks for clearing that up, Angus! Wowzers! They say the book is always better than the movie but those are some major liberties they took. Except for the Wizard being a tech support person in India named Bob and the Vertically Challenged People being Tom Cruise’s stunt doubles. That stuff was in the movie too, I think. Oh ANGUS…how I , (we…~ me and Duncan Dolittle) miss you . !! Still living through the tears of losing all of our friends…your story and your post and your version …put a sparkle and a glint in my eye…and the biggest smile…that a Scottie dog could give to another living human being ..that is real…REAL …yep, ya got that Zuckerberg? I just happen to be a person, not a dog,I am a person WITH a dog and you have canned me from existing…oh how I love you Angus…for making me smile…Love to you , Ainsley , Catman and your Momma..hope the head is feeling light and breezy ….and happy . Gonna now go and slam the keyboard around to try to get some customer satisfaction…impossible from Facebook…no such thing as …Customer Service …there are NO tech supports from any country..nope …..not for a multi million dollar business…nope …no help …nope nope nope . ..
aw…that above statement was from us, Angus …sorry for the Anonymous. I knew exactly who you were, General Doolittle. and they all lived happily ever after. Just not on facebook! ❤ you Angus. Details, details, details Angus. Actually it is only about ruby slippers and the marketing strategy to sell more ruby slippers. Looking forward to reading your next novel “Peter Pangus”. Will Ainsley be your Tinkerbell, with Lord Z being Captain Hook, or might he be the clock that the crocodile ate ….. can’t wait! Thank you for speaking the truth! We can always count on you! !